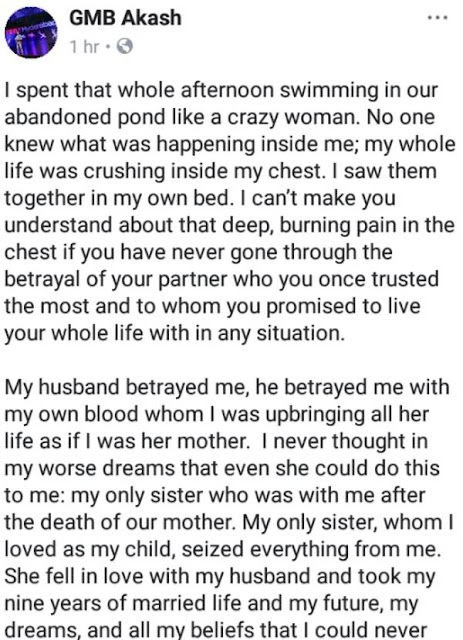 A woman has told the shocking story of how she found out her own sister whom she raised is sleeping with her husband. Hasina Akhter, a woman was shocked to catch her blood sister in her matrimonial bed with her husband but, to make matters worse, the sister has refused to let go of the man. The woman said she’s been unable to get the image of her only sister and husband in bed out of her head. She said it hurts more because she raised her sister and loves her like a child. The sister in question has been disciplined by their father and locked in their family home but she escaped and ran back to Hasina’s husband. The mother-of-one said she has tried committing suicide several times but she’s finally decided to live for the sake of her 4-year-old son. She has now left her husband for her sister. She says though she’s alive, everything inside her is dead.